Did the cable car ride take your breath away? Well take a moment to get it back – the adventure at the top starts here! You only need to take a few steps to see the most amazing view. 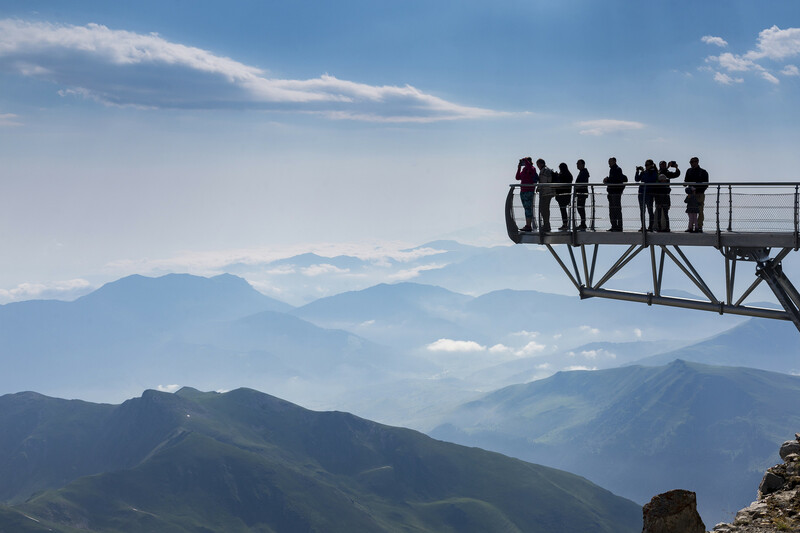 Let yourself be carried away by this unforgettable moment then walk on: the Pic du Midi still has plenty of marvellous surprises up its sleeve. As soon as you arrive, stroll on to the panoramic terraces for the most majestic of views: 300 kilometres of peaks stretch out before you. It will take your breath away. And while you’re at it, fill your lungs with that pure mountain air until you feel your head spin, and then go on your way. All along your route around the summit, information boards and graphics identifying the peaks you see help you to understand the context of the Pic du Midi: the history, the wildlife, the vegetation and even the sun, which you can observe through a small coronagraph. Our friendly team will take care to give you all the information you need, often chipping in with their own stories to bring the experience to life, and all in an easy-going light-hearted way. And if you fancy relaxing in the sun, seats and deckchairs are available to you for a moment of bliss. And once you’ve done, why not continue your visit at the museum. New: the Pontoon in the Sky ! Suspended over nothing but thin air a 10m metal walkway brushes up against the clouds and provides a unique and dizzying view. Visitors undertake an adventure with the feeling that they are flying. They focus on the horizon to brave vertigo and avoid getting dizzy. Free access. The majestic natural context of the Pic du Midi is also the backdrop to a wonderful human story of adventure. It started back in the 18th century with François de Plantade, Monge and D’Arcet, who began analysing the atmosphere and observing the stars. The construction of the observatory started in 1870, with the first buildings being completed some twelve years later. Extreme conditions made this project a real challenge. Read all about this fabulous story spanning several centuries and see the images in the museum. 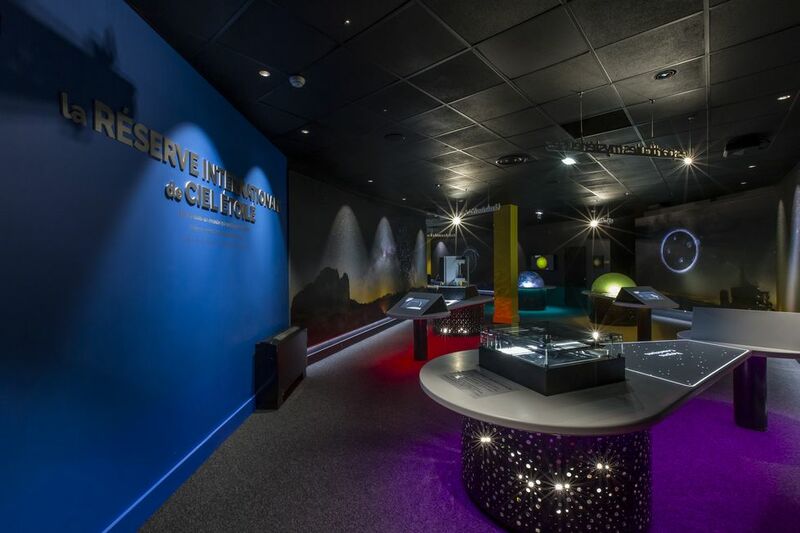 You can’t get so close to the stars and the sky without bringing them in, and the museum is also the place to see a series of images of the night sky. 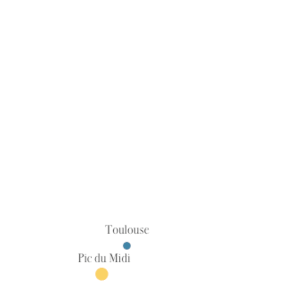 You will discover how the Pic du Midi earned its reputation as a renowned astronomical centre. Now tell me, aren’t you peckish yet ? A dining room and, in summer, a terrace, looking out over an unrivalled panorama of the Pyrenees to the south. This is where you will stop for a moment with your friends or family to savour dishes – including fast food – prepared from the choicest local produce. You can reserve a table, but only on arrival on site, at the restaurant itself. In winter, bitro / bar are open every day, restaurant is open during the holidays. *Excessive consumption of alcohol is a health risk. Please drink responsibly. Did you know the Pic du Midi plays host to a series of top events that you would never have thought? Whether it’s sport, music, gastronomy or culture, let yourself be inspired just as we are. On the winter sports front, the Derby du Pic has already firmly established itself on the calendar with snow enthusiasts coming from all over the world. The musical programme for 2016 includes concerts with the band Trottoir d’en Face, the Festival Piano Pic and a set from the DJ Synapson. There are sporting events throughout the year too, with the Caminade du Pic and the Grand Raid des Pyrénées mountain races, as well as the Pyr’Epic mountain bike event which ends up in Lourdes after 120 kilometres. All this as well as heritage days and science festivals – just a taster of what you can expect. For information on upcoming events, please see our diary. The visit over, it’ time to think of souvenirs. Did you enjoy your visit? Now, do you want to take something back with you to remind you of the magic? Stop by at our shop. Children can pick something up from our range of low cost items, and families and aficionados alike can buy books and cards on astronomy and the mountains. There’s even a post box for you to send your postcards off. But what’s that – you’re not ready to leave yet? Whether you’re an amateur astronomer or an incurable romantic, you won’t forget your night at the Pic in a hurry. Feel special as you make your way to your room just as the other visitors begin their journey back down. No, it isn’t a hotel room, but it is simple and comfortable and above all, it has the most magnificent view over the Pyrenees range. You will be able to share all the facilities usually reserved for the staff so that you can immerse yourself completely in the Pic du Midi experience. Once you’ve settled in, you will be invited to take part in the activity programme, with our expert who will take you on a trip beyond the milky way. In the early hours, you will watch the sunrise; then after a well-earned breakfast, you will be taken on a tour of the scientific facilities.